Sometimes it is required to create the lightning component at run time and destroy them. For example you can create a modalDialog box which display different messages to user. So while performing any operation like deleting records, you want to display message saying deleted successfully of not able to delete due to some error, then you can create the modalDialog box dynamically and destroy it. type (String) :Type of component to create like lightning:button, lightning:component etc. attributes : Map of all parameters required for new component. callback function: Once the component is created, this callback function will be invoked.This function can be used to append newly created component to target component. You can place the newly created component inside some div to display. Whenever user clicks on create button, controller will create new button dynamically and append it in <Div/> tag. Controller always checks for v.body which returns the body of component and will check the length of body and append label to new button. You can simply fetch the body of lightning component and set it to blank array. In above example, in order to delete all buttons present in div tag, we find the div tag with aura:id and set the body as blank array. In order to remove all content of any components, simple set the v.body to blank array. Suppose you have created a custom component like c:myCustomDialog and you want to create is dynamically and want to use in component say c:listComponent then you have to specify the c:myCustomDialog componet as a dependent component inside c:listComponent. This will ensure that the component and its dependencies are sent to client when its needed. type : type of resource component depends on. It can be COMPONENT, APPLICATION, EVENT. The default value is "COMPONENT". You can specify type="*" to match all type of resources. Hope this will help you all understand the basic of creating and destroying the components dynamically. Looking forward for your comments and feedback!!!! If you have file URL for file stored outside the salesforce, then you can fetch file information from external URL by performing a call out to external system and store the file in salesforce. For Demo purpose, I have uploaded a pdf file in Google drive and shared it with link with people. Now I will fetch this file and will store it as attachment in salesforce under account record. You should specify the file content type before creating attachment in order to properly view file. You can add additional parameter as fileName in "createAttachment" method, if you you want specify the attachment name while creating attachment. For this you need to add external URL in Remote Site Settings. For this example, I have added "https://drive.google.com/" in remote site settings. Box File Picker allow your users to share their Box content with your application — without using OAuth! Now we are going to use below code sample to implement this in Salesforce. In order to use Box File Picker, you need Client Id or API Key. 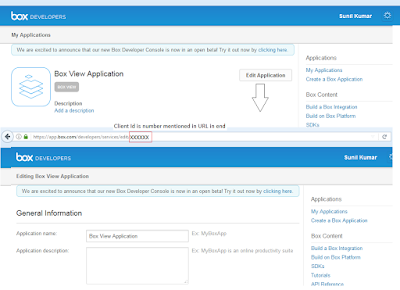 Navigate to your box application and click on Edit Application button. linkType : The type of link. Can be direct or shared. direct : Allow you to select only files not folder. multiselect : true or false. Success function : Whenever user select files or folders, response is passed as JSON in sucess callback handler. Please refer Fetching File from External/Public URL for more details on this.